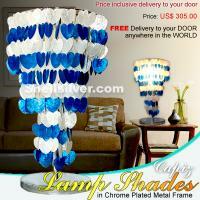 3 layers Capiz chips natural white and blue heart shape, 71 strand, 419 pcs. 50mm capiz chips with electric fitting. 24inches from top to bottom, 21inches top to end of the capiz chips/strand head frame 12inches diameter. 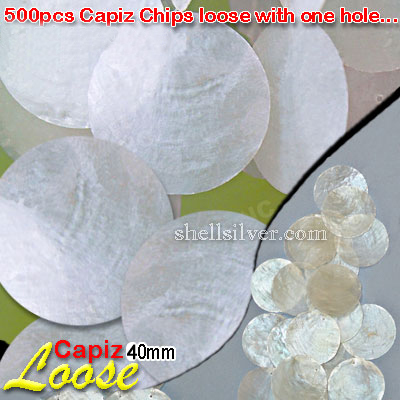 Capiz Shell Loose 35mm diameter - 500pcs Capiz Chips with one hole and delivered anywhere in the wor more.. 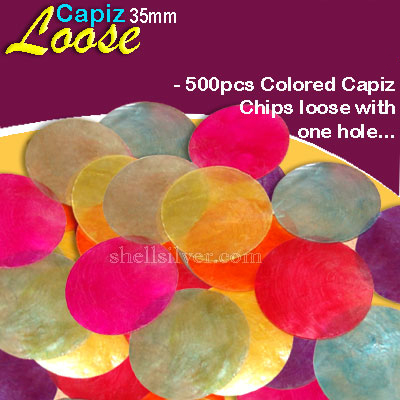 Colored Capiz Shell Loose 35mm diameter - 500pcs Colored Capiz Chips with one hole and delivered any more..
A CUT-IT-Yourself 857pcs. Capiz chips 35mm diameter in 30 meters nylon strand. 3 nylon strand 10 met more..
A CUT-IT-Yourself 860pcs. Colored Capiz chips 35mm diameter in 30 meters nylon strand. 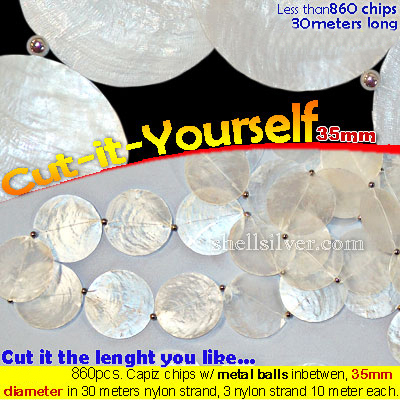 3 nylon stran more..
A CUT-IT-Yourself 860pcs. Capiz chips 35mm diameter in 30 meters nylon strand. 3 nylon strand 10 met more..
A CUT-IT-Yourself 860pcs. Capiz chips w/ MetalRings 35mm diameter in 30 meters nylon strand. 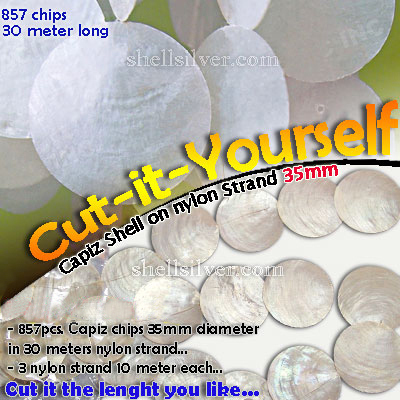 3 nylon more..
Capiz Shell Loose 40mm diameter - 500pcs Capiz Chips with one hole and delivered anywhere in the wor more.. Colored Capiz Shell Loose 40mm diameter - 500pcs Colored Capiz Chips with one hole and delivered any more..
A CUT-IT-Yourself 750pcs. Capiz chips 40mm diameter in 30 meters nylon strand. 3 nylon strand 10 met more..
A CUT-IT-Yourself 755pcs. 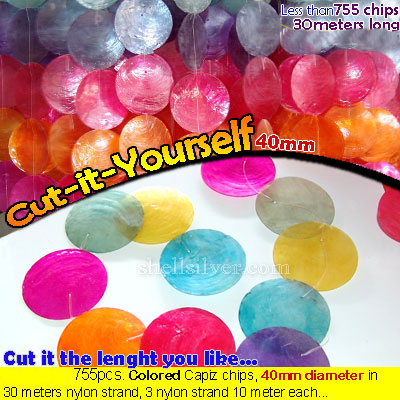 Colored Capiz chips 40mm diameter in 30 meters nylon strand. 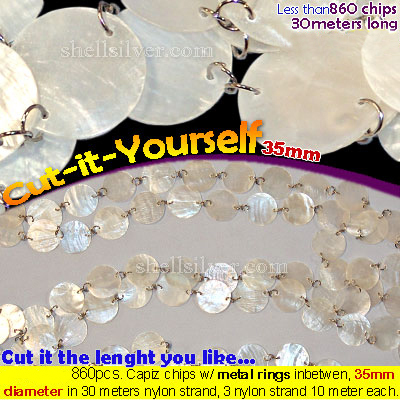 3 nylon stran more..
A CUT-IT-Yourself 755pcs. Capiz chips w/ MetalRings 40mm diameter in 30 meters nylon strand. 3 nylon more..